The staff at the Professional Bartending School will help you learn to bartend. There is about 70 years of experience in the school as bartenders and managing bars. Lets start with the director. The nation’s Capitol is filled with politicians, power-brokers, lobbyists, and a plethora of international dignitaries making backroom deals, forming the laws of the country and the world; however, Washington’s true little secret is that you know Tommy. In a city that consumes more alcohol per-capita than any other in the country, if you’ve been to a bar in the last 40-some-odd years you have met someone that was trained, managed, or otherwise influenced by Tommy Hanavan and The Professional Bartending School. Tommy began his career in hospitality innocently enough: as a way to pay his way through State University of New York without the need for student loans. What he ultimately found was much, much more. After graduating college, he decided to continue on in the food and beverage industry because he discovered something that most people only dream of: he found a career he loved that provided a generous and reliable income. 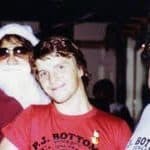 Although Tommy began his bartending career behind the stick in New York’s busy bars and nightclubs, over the years he has held virtually every position in the restaurant business from head bartender to general manager, staff trainer as well as an international hospitality consultant. His status as Master Trainer for the TAM alcohol awareness program (a distinction which only three individuals in the entire world hold) merely confirms his remarkable credentials and passion for this industry. The first takes place in the town of Vernazza on the Italian Riviera. It is a historic little fishing village turned tourist destination that hangs off the cliffs of the La Spezia region. Initially he arrived with the intent of improving his poor-at-best language skills, however, shortly after befriending the town’s sole bar-owner he found himself mixing drinks and training staff every weekend at a bar that overlooked the Mediterranean Sea. His second highlight was a tour though the Caribbean islands. Unlike Italy, this was no vacation. S.T.E.P. (a government organization designed to promote tourism in Central America) contracted Tommy (based on the reputation of the school) to develop, arrange, and coordinate a training program for the staff of the many hotels, bars, resorts, and nightclubs that dot the islands and coastlines of the Caribbean. He was so successful in his efforts training local staff to cater to the needs of the wealthy tourists that the Commonwealth of Dominica (an island nation tucked between Guadeloupe and Martinique) hosted a two week hospitality seminar utilizing Tommy’s leadership and unique curriculum. 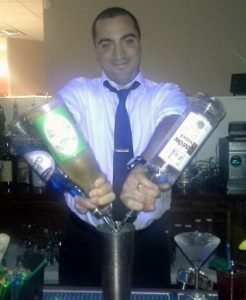 Tommy’s career has taken him from Canada to South America as far east as Europe and everywhere in between; nevertheless, the third highlight of his career is still ongoing: leading one of the finest training programs and the most successful job placement assistance program of any bartending school in the country. To this day, he can still say he truly loves his job. Getting started in the service business at 15 as a busboy, over the past 15 years Brian has worked as a server, line cook, host, bar back and predominantly as a full-time bartender. He’s bartended from Ocean City, MD to San Francisco, CA. From top tier restaurants to Irish pubs to dueling piano clubs. His background in Education – Secondary English BA and TESOL Certificate – creates a more comfortable student centered classroom. With energy and experience to spare, Brian is waiting to share all of his tricks of the trade with you. You should check out reviews that mention Brian. Former students really love his classes and he enjoys teaching them. You can find some of those current reviews on Google or Yelp. If you want to get a feel for how real, fun, and informational Brian’s classes arrange to visit. Or, you can read this review on Yelp about a brewpub in Leesburg with a great review written on 6/27/2014. The review was worth 5 stars, the bartender earned a great tip….and the little trick came right out of Brian’s class. He teaches grads how to make money. 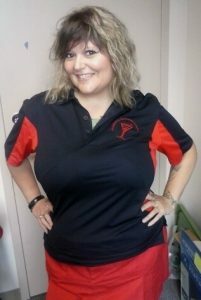 Heather is our Placement Director and a grad of our program. For as many years as our school has focused on placement assistance and helping graduates land bartending jobs, Heather has set new records for volumes of grads landing bartending work and numbers of different bars, clubs, hotels, restaurants, and employers that hire our grads. She is terrific working with both grads and employers throughout the region. You will want to meet and work with Heather. She can help you. Heather has years of direct customer relations experience, hospitality experience, hotel, restaurant, and sports bar experience and more recently bartending experience. That extensive work history translates to skills that enable her to better assist grads land bartending work. She understands hospitality. In fact she regularly networks with staff from one of the largest industry employers in the region. She has keen insights into not only where the jobs are, but the skills and attitudes that enable bartenders to get ahead and land the best shifts. Here is one more element to Heather’s extraordinary skills and the record volume of bartending jobs that our grads land. Heather speaks, emails and communicates with graduates and employers every day. It’s an ongoing daily process that occurs all day long. She is good at it and she works at it. Recently a long time employer who has hired grads over the years visited the school. We have visited his establishment. One question and one unique response caught our attention. We asked who else has contacted him about available bartenders that he could access for employment. His answer –> Nobody. Nobody else does what Heather does. She does it well. Come and visit her. Gabrielle was born and raised in Washington, DC and started her career in hospitality at the age of 16, working at The Washington Zoo; Food Service Department. She stayed at that job through High School. She then went to college, studied business and worked in finance jobs till the office environment grew old and tired. In 2004, she enrolled at The Professional Bartending School. She quickly started working at Avenue Night Club. Years later she found her niche’ in cocktail lounges and spent a a large part of her career at Posh Supper Club and Lace Restaurant & Lounge. Both offered quality cocktails, fine dining cuisines, and live music. 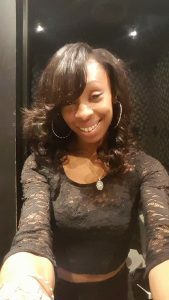 In 2015 she took her love for bartending a step further and started a beverage catering company, DC Block Girl, LLC, that services the Washington, DC Metro area. The business caters private events such as weddings, reunions, and corporate events. As luck would have it, her experience as a bartender brought her full circle, back to where it all began. Now, teaching at The Professional Bartending School, she is educating new students the art of mixology in hopes that they will have the same love for bartending and hospitality. Gabrielle’s classes reflect the years of experience in the industry and feature the little tricks and effective methods that turn newbies into skilled bartenders. Arrange to visit when Gabrielle is teaching. Students are in for a treat if they take classes with Tyeshia. She has vast bartending experience dating back to 2002, she is a teacher by training, and she taught bartending and opened two fantastic clubs in Addis Ababa, Ethiopia, all before she started teaching at the Professional Bartending School. Currently students love her. Not only does she have vast experience but she is a teacher by training and experience. Guess what? Tyeshia took our program back in 2002. You should ask her why she got into bartending back then. It obviously worked. 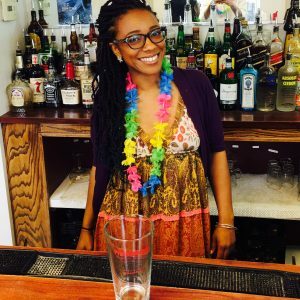 She has been one of DC’s popular recognized bartenders for over a decade. After graduating she was bartending within a week at Family Bar and Restaurant in Temple Hills, Maryland, right off our then job placement leads list. She moved from there to both well-known Timheri’s in Adams Morgan and landed a day bartending job at the busy Fish Market in Alexandria. By 2005 she was bartending at popular U Street Lounge Bar Nun and sometimes after became the Bar Manager. Bar Nun converted to Pure Lounge about 2007. Tyeshia is still there, one of the prominent bartenders at this popular lounge/club. She is experienced and excellent. Over the years she has been found bartending at Ketchup in National Harbor and popular Saki and District in DC. That is an enormous amount of time behind many varied bars and environments. But it doesn’t include her international experience setting up a popular club and teaching bartending. Today if you search on the web for The Vault in Addis Ababa, you will find a spectacular and gorgeous club located in the Capital of Ethiopia. Our star, Tyeshia helped to open this popular establishment and taught all the bartenders. (BTW: She used our textbook). Summer Hiring Season: Best season to get hired as a bartender and the start of the strong earnings season. Call now to visit the school.